I should never have moved back to Vodafone. 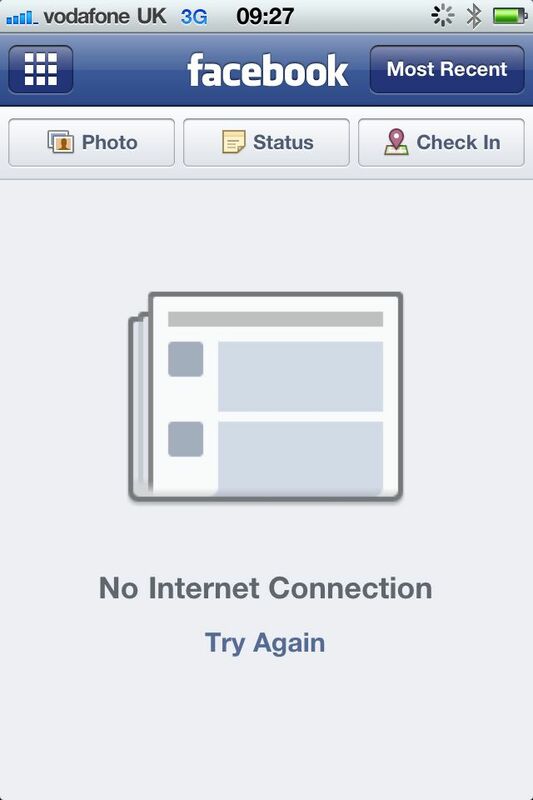 The last 16 months have been an incredibly frustrating experience, as life as a Vodafone customer has meant constant inability to use the mobile internet. I can’t wait for my two year contract to end in December. It never occurred to me that Vodafone would be dramatically worse than O2. I had been a Vodafone customer, corporate and personal, for 16 years before I switched to O2 when I got my first iPhone (the second, iPhone 3G, model) in October 2008. For many years Vodafone ran adverts boasting it was the best network for voice calls, and it never occurred to me that it would prove so appalling for data coverage and performance. From the day I moved back to Vodafone in December 2010 I found 3G coverage almost non existent, despite the company’s charts showing how widespread its 3G network was. I can only assume that the company hasn’t increased capacity to match demand – what I found was that a supposed 3G signal dropped to Edge or worse by the time I tried to do anything. And that was when I was stationary. On the move, Vodafone is almost useless. 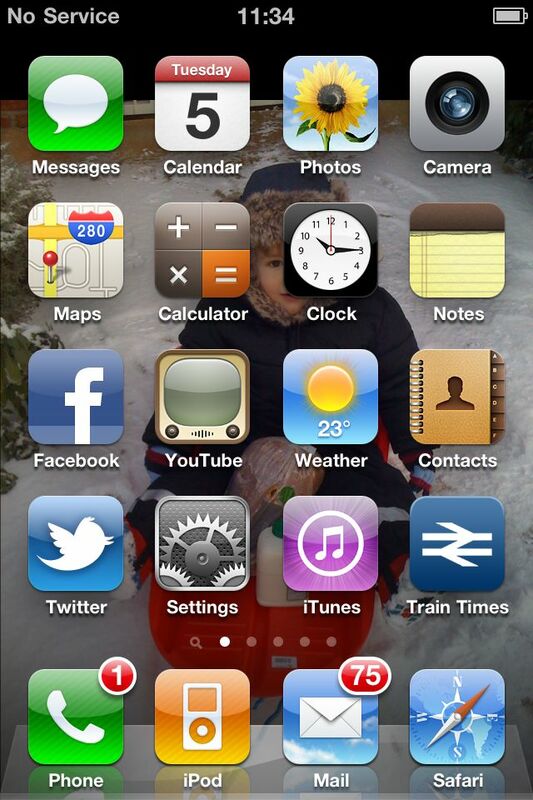 My Vodafone iPhone is constantly searching for a signal, and all too often comes up with no service. Tonight, as a passenger on a journey down the M40, I wanted to find out about the distinctive tower next to the motorway near Bicester. By the time I reached home 40 miles later, I had only managed to get a page of Google search results. 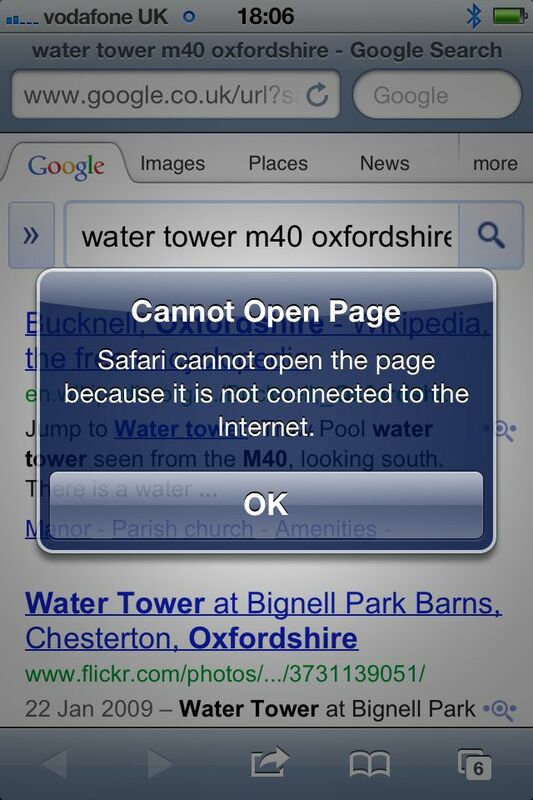 The shocking Vodafone network failed to open the two most promising search results despite 35 minutes trying. It took just 12 seconds on my home wifi network to find out that the tower was distinctive 1909 water tower at Trow Pool near Bucknell. Vodafone isn’t just poor for data. I can no longer get a reliable voice signal at home – despite years of never experiencing a problem. (I used to feel sorry for people on Orange who found they couldn’t use their mobile at home.) And before you ask if my iPhone is to blame, my work BlackBerry proves that Vodafone is just as bad on the RIM device as on Apple’s iPhone. 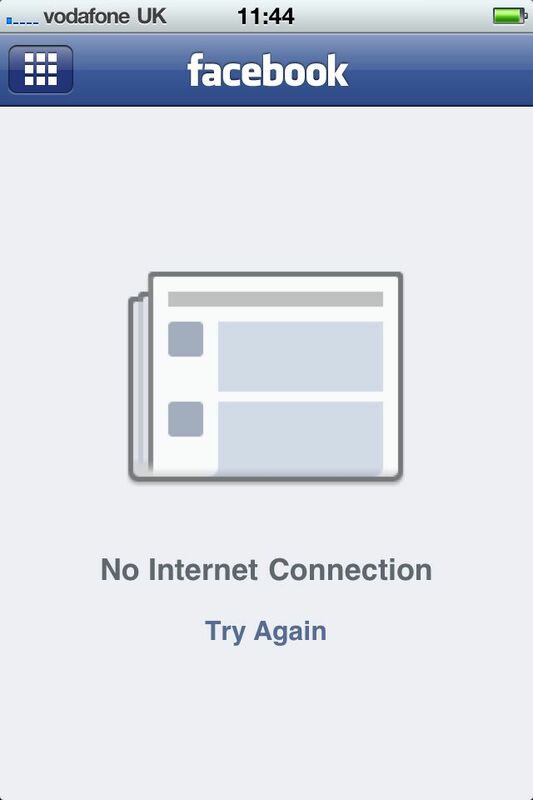 Even in London, I find Vodafone unreliable. I found even Edge (never mind 3G) out of reach at one point in Westminster and on a walk back from a dinner in town last year I couldn’t get online once in 15 minutes. Breaking up won’t be hard to do when my two years are up. I’m likely to buy my next phone SIM-free so I’m not held hostage again for two years by a failing mobile network. UPDATE: my post has struck a chord. A neighbour says he got Vodafone to give him a Sure Signal device to stop him cancelling his contract. (He couldn’t get a signal in his house without it, and also finds mobile internet impossible with Vodafone.) Another friend recommends Three’s mifi device to get online rather than rely on Vodafone. Just some of the responses I’ve had. Let’s see what Vodafone says. UPDATE, Tuesday 8 May: kudos to Vodafone for replying to this post offering to help, and also contacting me via Twitter. I will update after I get its response to my email. This entry was posted in Business, Tech and tagged BlackBerry, Business, iPhone, O2, Technology, Vodafone by Rob Skinner. Bookmark the permalink. If you can email my team via: http://goo.gl/6yQBT we’ll be more than happy to get in touch to discuss this further. Please ensure you put the code WRT135 in the subject (no spaces) to ensure that the email is routed into my team. Thanks for your comment and offer to help, Jenny. I have emailed as requested and look forward to hearing from you. Hi Romk1n – yes, Vodafone were quick to get in touch. They’ve sent me a Sure Signal device to help at home. They couldn’t offer any help with the bigger problem – the inadequacy of the network to provide a decent mobile Internet service on the go. I sense they simply can’t cope with the demand. yeah, i heard they upgrading the network to support 3G900 which would mean 3g in more places, but agree vodafone needs to do something about it sooner rather then later.